Our Senior Services Directory has many good articles on Congregate Meals and Meals on Wheels programs or Adult Learning or life learning is important. A Senior Center helps with Aging in Place and this article shows why. Articles about Home Care services and the importance of socialization as you age. Last but not least is senior dating tips. But check out our senior services directory for more. Centers may provide congregate meals like a breakfast or a tasty hot lunch free or for a small donation. Congregate meals are meals that are offered to seniors in groups and provides at least one meal per day to seniors at no cost. All seniors 60 years of age and over, regardless of income, are eligible to participate in and receive free meals in a congregate meal setting. These program contribute to nutrition and health. For meal reservations call your senior center. In a poll the most common responses seniors gave for eating at the center were that they enjoyed the meals (63%), enjoyed socializing (61 %), and meals are inexpensive (57%). Adult Recreation Center, Senior Community Center and Senior Citizens Center. National Institute of Senior Centers - NISC is a dynamic network of senior center professionals from around the country. They believe that senior centers create opportunities for successful aging in our communities. We would agree with the above statement based on our observations. Participants seem to be happier and more engaged in life and are interesting to talk with. By some accounts, there may be 15,000 Senior Centers in neighborhoods across America. These are places where seniors age 50+ can visit that provides programs and services that will help them stay active and engaged in their communities. Programs and activities vary between centers. All programs serve senior citizens needs for social interaction, intellectual stimulation, emotional enhancement, programs and activities for seniors to help to improve and maintain their physical condition, wellness, and overall quality of life. 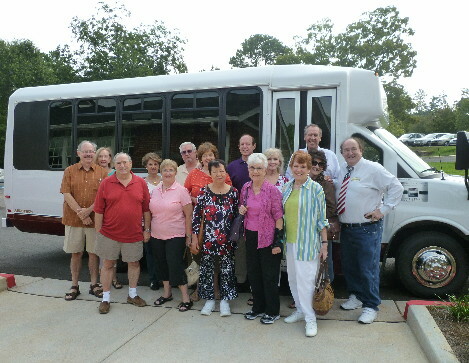 Adult Education and Recreation Centers are for the more active 50+ and are very popular. These are similar to Senior Centers but offer programs geared toward more active and younger users. Adult Centers are usually part of the Parks and Recreation Department and don't include congregate meals. "A Senior Center helps seniors maintain their independence and vitality." Senior Centers have other programs that assist seniors including transportation, assistance with government programs like Veterans benefits, Medicare, and Income Tax return prepartion. 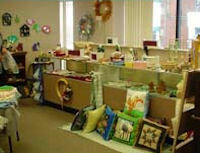 The purpose of SeniorCenterDirectory.com is to help you understand senior centers and what they provide. At the top of this column use the drop down box to find information about centers in your city or county. 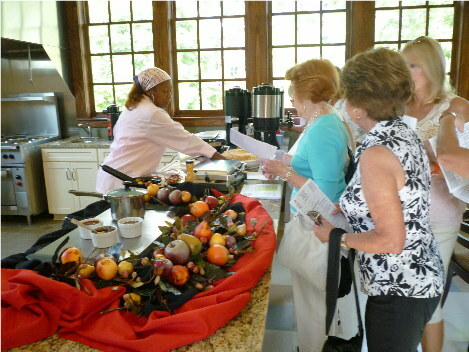 Above is a photo I took at the opening of the Johns Creek GA Active Adult Center and is of a cooking demostration in their wonderful commerical kitchen. This center is located in a renovated historic school house located in Newtown Park. Adjacant is the community vegatable gardens and the new Bocce Ball courts. As baby boomers become seniors (boomers are turning 65 this year!) Centers will be changing to accommodate the boomer's generation and lifestyle. We have some articles about visits to Senior Centers. We have visited some impressive and then some not so impressive centers. A Senior Center can be a great resource for you as you age in place in your own neighborhood. Get out today and visit one. You are sure to receive a warm reception. A senior center is different than a senior community. You visit a senior center in your neighborhood. A senior community is a retirement community where you live. These are totally two different things. Baby Boomers do not always like the names "Seniors" or "Senior Citizens". So some other names are beginning to be used like Active Adult Center and Adult Activity Center. Who are Users of Senior Centers? People who stay and age in place in their own neighborhoods, even though we have heard many people who move to a community located near a center, which sounds like the ideal set up to us. Age requirement varies by location, we have seen many at age 50, many more 55 and 60, with the highest age limit requirement being age 62. You are sure to enjoy interacting with people your age from your own neighborhood that use your local center. Single, widowed, divorsed and married couples all enjoy the use of their center. Some use and also voluteer at their center. Centers are not all alike, so get out and visit the ones in your area or an area you are thinking about moving to. No better time to visit now. You will be welcomed and given a tour of the facilities and the activities provided. Just do it, it is fun! Many first time visitors sign up for an activity like the book club, walking club or yoga or even just take a one time class on something interesting. Most offer all or some of the following activities, which is one of the main reasons for their existence, to keep people active and engaged. Activities include exercise and fitness programs; computer classes; arts and crafts; recreational, educational, and social activities; health screenings and services; special programs and speakers; and volunteer opportunities. Centers offer dances and dance classes which we have found is an extremly popular activity. Also there are travel opportunities both locally, regionally and worlwide. The growing population of senior aging in place is increasing the demand for programs and services like those provided by your local senior center. Activities for seniors help you age in place right in your own neighborhood. Want to learn how to retire? Just visit your local senior center. There you will find things to do and people to do them with! Many Centers provide Meals on Wheels programs and this is also a volunteer opportunity for seniors.